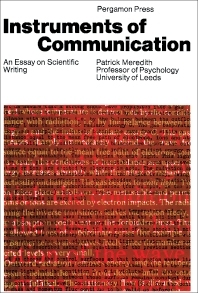 Instruments of Communication: An Essay on Scientific Writing provides an introduction to the instruments of logic and language. This book focuses on what people use in their communications, such as the materials and forms by means of which people share their experiences, meanings, intentions, feelings, hopes, and understandings. Organized into five parts encompassing 20 chapters, this book begins with an overview of the different forms of inter-organic communication. This text then examines the particular case of rational communication wherein it results in a shared understanding. Other chapters consider a certain concept of brain-function that underlies the treatment of language. This book discusses as well the concept of communication, which is not simply a process of transmitting messages but a process of sharing experiences. The final chapter deals with the different ways of classifying social behavior and explores the associative basis of communication. This book is a valuable resource for scientists, physicists, physiologists, and psychologists.